Todd proposed by giving Jackie a Precious Moments figurine with the ring on it along with two dozen roses. How large was your wedding? Five attendants and a junior groom and junior bridesmaid. About 300 people attended. A chicken and mashed potatoe dinner and angel food cake at the reception at Jerry's Supper Club in Richmond. Each groomsman put a piece of paper on the altar that, in the end, read: "It's Not To Late To Run." What was your most memorable wedding gift? 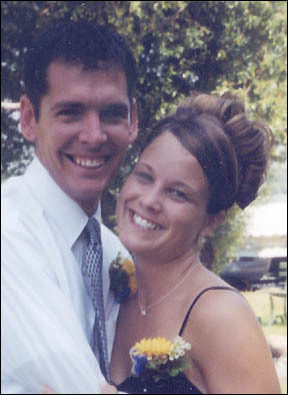 Jackie had made a bet in eighth grade with teacher Darrel Carstens that she would marry Todd. The bet was a case of pop, and we got that along with the original slip of paper that the bet was made on. What wedding gift do you use the most today? Our dog McEntire was a gift from my brother Terry, and he probably gets the most attention besides the usual pots and pans. Good question. We don't remember. Whose relatives, or friends, had the most fun at the reception? Todd's oldest brother lit up the dance floor. Where did you go for a honeymoon? We went on a Bahamas cruise to Nassau, Freeport, and Coco Cay. What do you do to keep romance alive in your marriage? Even though we have three kids that keep us very busy, we make time to go out by ourselves.